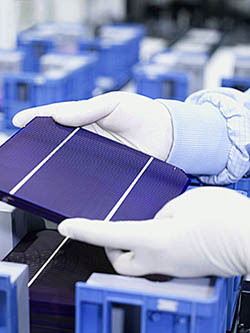 A large majority of solar cells are made from silicon. 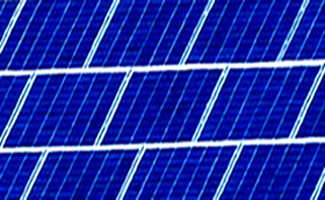 In this section we will discuss only crystalline silicon cells (see the section in Solar In-depth for thin film types of cells). 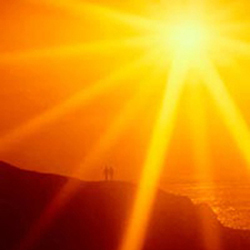 When silicon absorbs sunlight, the energy from the sun excites some of the cell's electrons into a mobile state where they are free to move around the entire cell. However, in a piece of plain silicon there is no reason for them to go in one direction rather than another (electricity is the movement of electrons in one direction). However, in solar cells, there is a separator called a junction, where two slightly different types of silicon meet. The two types of silicon are pretty much the same, except each one is "doped" - has a tiny percentage of other materials mixed in. The two types of doping (called n-type and p-type) determine its electrical properties. When a random electron reaches the junction, it is accelerated across it (think about a waterfall ... the water can only go one way - down). So this flow establishes an electron direction in the system. If a wire is attached to each side of the junction, and sunlight is absorbed by the silicon, the free electrons flow from one side of the junction to the other. This flow of electrons induces a similar flow through the external circuit. This is "electricity" -- electrons flowing in a single direction through conductors. This particular flow is called a DC current. 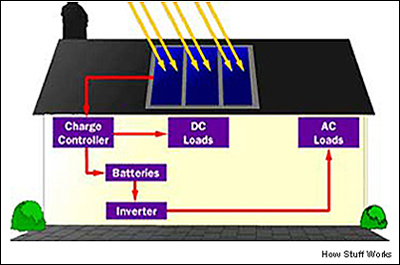 Residential solar systems, called photovoltaic (PV) systems, are said to be stand alone if they are not connected to the local electrical grid provided by the local power company. The illustration at the left shows the elements needed to convert power created by a stand alone solar system into a useable form for a house. Most households use only alternating current (AC). Solar panels produce only DC current. An inverter converts DC current into AC current. A stand-alone solar system uses batteries for storage to provide electricity on cloudy days and at night. However, energy stored in a battery has losses. Only about 80% of the energy that enters a battery can be retrieved. Also, batteries are kind of messy and they need to be replaced from time to time. 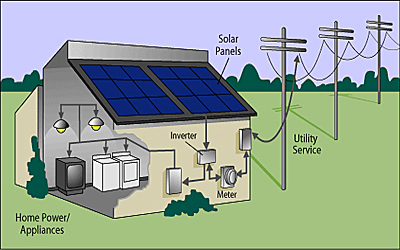 However, if you have a cabin in a remote area, solar power may be your only choice. Likewise, the space station and space ships depend on the conversion of solar energy to make living in space bearable. 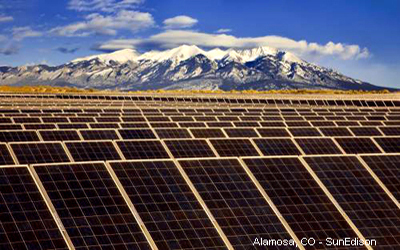 Not every area of the United States receives enough sunshine to generate solar power on a utility scale. The map at the left shows the average daily solar radiation across the US. The areas in red, orange and yellow are the primary targets for utility solar generation. 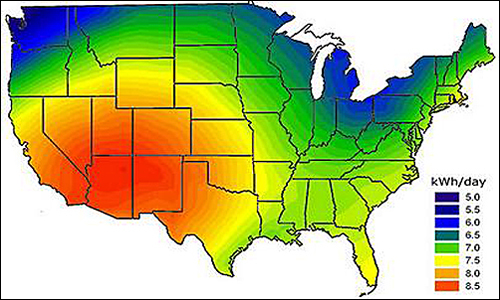 There is more than enough energy from the sun in the southwest to supply the electricity needs of the rest of the US. Moving electricity from the southwest to the northeast along high speed transmission lines (ala US freeways) incurs a loss of only about 11%. So transmission of long distance solar power is technically feasable. The main challenges for solar electricity to become a major player are cost and storage facilities. In spite of the fact that current costs of solar electricity are higher than other fuel sources, solar costs are coming down rapidly. Very large storage facilities are necessary to supply electricity when the sun is not shinning, i.e. at night and on cloudy days. Storage facilities of this magnitude are years into the future, so for now solar will be used in conjunction with other sources of energy such as wind, natural gas and nuclear. There are no new coal facilities being built, but quite a few exisiting plants are being upgraded.